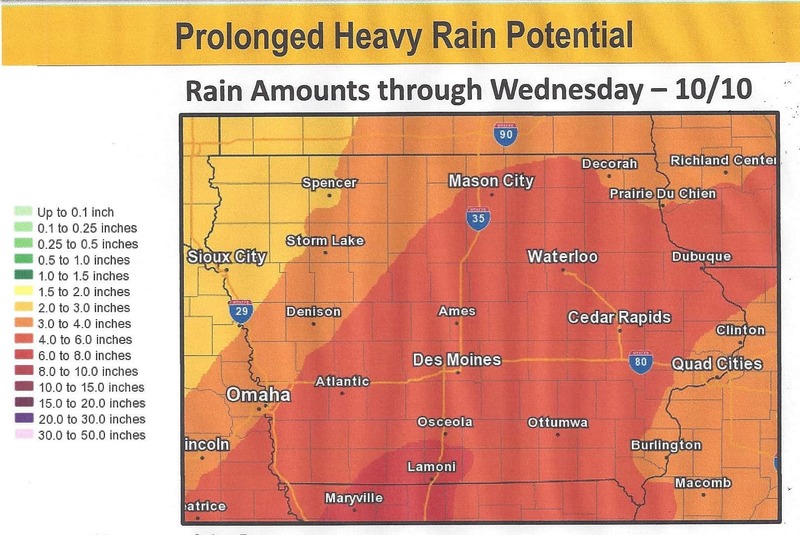 There are multiple rounds of rainfall expected to go across Iowa for the next several days. 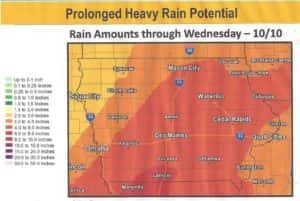 According to the National Weather Service, Greene, Dallas and Guthrie counties are anticipated to get four to six-inches of rainfall through next Wednesday. The first round of rainfall is expected Thursday night through early Saturday morning that could bring between 0.5 to one-inch of precipitation to our listening area. The next round of potential rainfall is predicted to be Sunday through Monday night, with the third round to take place from Tuesday into early Wednesday morning. From Sunday into next Wednesday, our listening area could see an additional four to six-inches of rainfall. Main threats include prolonged and heavy rainfall, river flooding and periods of flash flooding. The National Weather Service also has all of Dallas and Guthrie counties, along with the southern half of Greene County under a marginal risk for severe weather late Friday afternoon into Friday evening. Anytime there’s severe weather, Raccoon Valley Radio’s Severe Weather Action Team provides live coverage of each severe weather incident in Greene, Dallas and Guthrie counties. The one to count on for severe weather coverage is the Raccoon Valley Radio Network.